Sinn Féin’s national chairman Declan Kearney gave a long, detailed speech at Westminster on October 25 in the course of which he made proposals for progress towards what he calls “national reconciliation”. His speech was aimed at the DUP but the only reaction was a diatribe from Peter Robinson two nights later. Unfortunately, one of the suggestions Kearney included in his speech was that the British government should hold a border poll. Unfortunate, because it allowed unionists to avoid the real issues in his speech and go off into ‘No, no, no,’ land. At least Robinson saw where the real danger lay and furiously rejected any suggestion of engaging in discussion about reconciliation with Sinn Féin, deriding Kearney’s view of reconciliation as “a parody” of the concept. On the other hand Jeffrey Donaldson gratefully leapt on the border poll when the BBC singled that item out of Kearney’s speech. It’s difficult to say you’re against reconciliation you see. Donaldson couldn’t answer why, if he is so sure there would be a huge majority against a united Ireland, he set his face against a vote to confirm that. “Waste of money,” he kept saying. The matter is a lot more complicated than that as even Donaldson knows. 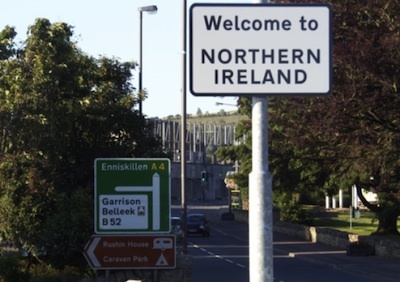 Sinn Féin people know perfectly well that the Good Friday Agreement stipulates the northern secretary will hold a border poll only, “if at any time it appears likely to [her] that a majority of those voting would express a wish that Northern Ireland should cease to be part of the United Kingdom and form part of a united Ireland”. Clearly that is not the case, so our proconsul can’t hold a poll. So why does Sinn Féin keep banging on about it? To be fair to Kearney it was last on his shopping list until the BBC promoted it to the top. Nevertheless, keeping it in the list allows Sinn Féin to do what Alex Salmond did in Scotland. Once Scottish independence was placed on the agenda as a serious item it required answers to a number of questions. For example, would there be one or two questions in the referendum? The answer is one. What would that question be? Who would design the question? Not David Cameron nor indeed Salmond but the Electoral Commission. Would Scotland maintain sterling? Would Scotland stay in Nato? Would Scotland get rid of the nuclear submarine base at Faslane? Would Scotland have to apply to join the EU? And so on. Unionists are scared stiff of even talking about a border poll because it immediately throws up a series of unwelcome questions. First, they would have to engage in discussion about a united Ireland. So, no, no, no. Secondly what would the question be? As you’ve read here before, it wouldn’t be, ‘Do youse want a united Ireland?’, so they could all roar, ‘Nevaar’. You’ve heard that before too. As part of the debate in the lead up to any poll the crucial item would be, what is a united Ireland? People need to know what they’re voting for, or against, for that matter. What would happen to people’s pensions for example? Rush off to look up what happened to pensions in the Free State in 1922. What would happen to the NHS? Would you have to pay [euro]50 to see the doctor? Would the north join the euro? What would happen to university fees? What would happen to selection at 11-plus? No, Sinn Féin and the DUP won’t have agreed that before a united Ireland. It would solve the issue of corporation tax though, wouldn’t it? All that, and much, much more, not to mention political and constitutional and legal structures will have to be agreed before a vote. That’s why unionists are terrified of talking about a border poll. They don’t want to think about any of that because they’d be sucked into real discussions about what form a united Ireland will take. Win or lose that’s what Salmond achieved in Scotland. For the next two years all Scottish politicians will have to spend their time clarifying what an independent Scotland will look like. Salmond has answers to all the questions. Unionists won’t even ask Sinn Féin what their answers are.